It will come when it comes to whom it comes, and not a second sooner. I had figured that everyone was waiting on the goods from the maker, but now I am not so sure how much the carriers are involved in this process. Rogers of Canada had indicated their version of this handset would get an update to Eclair this summer. The Rogers version uses the "32a" board (288 MB RAM). Most other versions use the "32b" board (192 MB RAM), including the Ion and ht-03a. 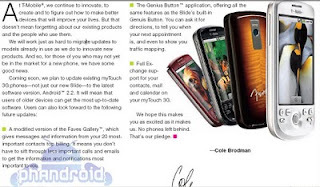 Now two new developments: Apparently Android 2.2 "Froyo" is officially coming to all the gazzilion T-mobile my Touch versions, which include both 32a and 32b boards (the one with the separate audio jack is 32a), with the "no phone left behind (except for the G1)" campaign. (In fairness, the new Android versions simply won't fit on the G1 without installing the Danger SPL, which frees up more nand space for the ROM by removing the /cache partition used (asfaik) for receiving OTA updates). The HTC Magic is not, and should not be considered to be the same model of handset as the HTC Sapphire or any other equivalents, so please try not to draw comparisons. This handset is viewed differently by both HTC and Google so it cannot be assumed that what applies to one applies to the other. So from this I know that it is a 32b board Sapphire with security disabled (yay goldcard!) and an HTC build. What does this have to do with anything? Nothing I guess. Maybe we'll get 2.1 in Japan. Maybe we'll get 2.2. Maybe we won't get anything. It is a good thing Cyanogen does what he does. And while I'm rambling around with this post, thought I'd share this: We all know this phone doesn't support i-mode. In doing some googling for this post, I ran across this. Brilliant! Which link? I don't get it either, by the way. I meant: "In doing some googling for this post, I ran across this. Brilliant!" The image at the bottom of the post.. Kudos on your researching skills. It really does seem like it's a 50/50 on whether Docomo will release 2.1 or 2.2 for the HT-03A. My chips are betting on 2.1 because Docomo seems to be retarded and backwards like that. Why give us the latest and greatest when they could give us the second best? Meanwhile Cyanogens latest mod is defintely the best available if people are impatient (like me). His latest 5.0.7 stable is smoking fast compared to everything else I've used. Wondering if he's going to look at 2.2 as his next big project, or perhaps that requires too much fiddling at this point. Thanks! I'd say 33.3/33.3/33. for 2.2/2.1/1.6 forever. Cyanogen has already said that CM-6 will bring 2.2 Froyo to the G1/Dream and Sapphire/Magic, by the way. 5.0.8 stable is out now. There seems to be some folks having issues with it, but for me it is running great. .8 includes ADW Launcher as the default home screen. This means that spare parts can be now used to keep the ADW home screen in memory. Of course people were doing this before with replacement home screens, which installs in /data/app like all user-installed APKs, by not installing it but rather removing the default launcher files, pushing the appropriate files to /system/app, and renaming to apk. I had been using LauncherPro instead of ADW launcher because the former loaded the contacts and the dialer, etc. much faster than the latter. Now with ADW as the default launcher, pushing the call button brings everything up near instantly. And speaking of spare parts and ADW, they have been moving to the settings menu. If you are using an alternate home screen, the settings for ADW won't show unless you set ADW as the default or just uninstall the alternate home app. Minutes after posting I thought about checking CM for updates. Lo and behold 5.0.8 stable was out, haha. I just updated to .8 and wow, what a difference. No issues thus far, and everything is seemingly faster. ADW is a great addition to this version and the amount of customisability (like colour choices for the notification drawer!) is just fantastic. My only gripe is over battery life now. Over 5-10 minutes of configuring settings etc I watched my battery drop 4%, which seems like a ridiculous amount considering what I was doing. Ta for the link about Froyo 2.2. Super excited to see how that goes. Have actually restored back to 5.0.7, as .8 was draining far too much power for my liking. Even .7's power usage is a little on the ridiculous side at times. Sigh, someday I'm sure there'll be a sweet-spot ROM. Perhaps CM's 2.2 build. Just have to wait for 2.2 to turn up on AOSP. Look on the bright side, you could still be stuck with Docomo's stock 1.6 ROM ;-) After installing CM-4, it was like having a brand new phone - even more so for CM-5. I'm sure all the kinks will get worked out. Hopefully drivers direct from the manufacturer become available so CM can incorporate them. I have a feeling that it is the lack of proper drivers that is resulting in some of the inefficiencies we are seeing with CM-5. Froyo source code made available today! Looks like the "23rd" rumors were sorta true. Now the countdown begins... when will they release it for my Desire! ?